One by one by one by one, each with fresh heartbreak, hearses crisscrossed two New England towns on Wednesday, bearing three tiny victims of the Sandy Hook school massacre and a heroic teacher in a seemingly never-ending series of funeral processions. "The first few days, all you heard were helicopters," said Dr. Joseph Young, an optometrist who attended one funeral and would go to several more. "Now at my office all I hear is the rumble of motorcycle escorts and funeral processions going back and forth throughout the day." As more victims from the slaughter of 20 children and six adults were laid to rest, long funeral processions clogged the streets of Newtown, where Christmas trees were turned into memorials and a season that should be a time of joy was marked by heart-wrenching loss. Most students in Newtown went back to school Tuesday except those from Sandy Hook Elementary, where a gunman armed with a military-style assault rifle slaughtered 20 children and six teachers and administrators Friday. He also killed his mother at her home. If police know why, they have not said. Students at Sandy Hook, which serves kindergarten through fourth grade, will resume classes in a formerly shuttered school in a neighboring community in January. Donna Page, a former Sandy Hook principal who is now retired, will take over as principal, NBC Connecticut has learned. In its first statement since the shooting, The Newtown Police Department assured the community that its "schools are safe" and said that the department will "work with our community partners to restore a sense of security and normalcy to Newtown." State Police also said that its final report could be "several months away." In the meantime, mourners overlapped at back-to-back funerals that started Monday and will continue all week. At St. Rose of Lima Catholic Church, mourners arrived for Caroline Previdi, an auburn-haired 6-year-old with an impish smile, before the service had even ended for Daniel Barden, a 7-year-old who dreamed of being a firefighter. "It's sad to see the little coffins," said the Rev. John Inserra, a Catholic priest who worked at St. Rose for years before transferring to a church in Greenwich. He returned to his old parish to comfort families wondering how a loving God could permit such carnage and has attended several of the funerals. "It's always hard to bury a child," Inserra said of the seemingly unrelenting cycle of sorrow and loss. "God didn't do this. God didn't allow this. We allowed it. He said, 'Send the little children to me.' But he didn't mean it this way." For full U.S. and world news coverage, visit NBCNews.com. 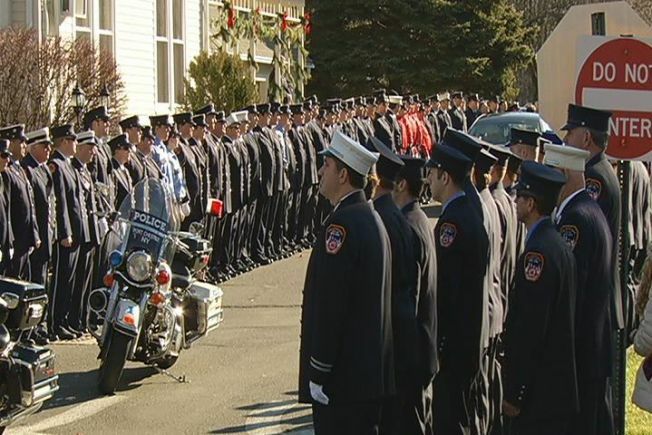 Hundreds of firefighters formed a long blue line outside the church for little Daniel's funeral. Two of his relatives work at the Fire Department of New York, and the gap-toothed redhead had wanted to join their ranks one day. "If me being here helps this family or this community just a little bit, it's worth it," said Kevin Morrow, a New York firefighter and father of two young girls. "He wanted to be a firefighter, as any young boy wants to be." Family friend Laura Stamberg, of New Paltz, N.Y., whose husband plays in a band with Daniel's father, said that on the morning of the shooting, Mark Barden taught his son to play a Christmas song on the piano. "They played foosball and then he taught him the song and then he walked him to the bus and that was their last morning together," Stamberg said. At Caroline's funeral, mourners wore pink ties and scarves — her favorite color — and remembered her as a New York Yankees fan who liked to kid around. "Silly Caroline" was how she was known to neighbor Karen Dryer. "She's just a girl that was always smiling, always wanting others to smile," Dryer said. Across town, at Christ the King Lutheran Church, hundreds gathered for the funeral of Charlotte Helen Bacon, many wearing buttons picturing the 6-year-old redhead. Speakers, including her grandfather, told of her love of wild animals, the family's golden retriever and the color pink. She was "a beautiful little girl who could be a bit stubborn at times — just like all children," said Danbury resident Linda Clark as she left the service. And in nearby Stratford, family and friends gathered to say goodbye to Victoria Soto, a first-grade teacher hailed as a hero for trying to shield her students, some of whom escaped. Musician Paul Simon, a family friend, performed "The Sound of Silence" at the service. "She had the perfect job. She loved her job," said Vicky Ruiz, a friend since first grade. Every year, Soto described her students the same way, Ruiz said. "They were always good kids. They were always angels," she said, even if, like typical first-graders, they might not always listen. In Woodbury, a line of colleagues, students and friends of slain Sandy Hook Principal Dawn Hochsprung, 47, wrapped around the block to pay their respects to the administrator, who rushed the gunman in an effort to stop him and paid with her life. U.S. Secretary of Education Arne Duncan attended the service. "She loved kids. She'd do anything to help them and protect them," said Joann Opulski, of Roxbury. In emotion-charged Newtown, tempers flared as residents of the town of 27,000 navigated the hordes of reporters and camera crews that descended on the town. Some shouted at reporters outside the funerals Wednesday, urging them to leave their town in peace. Cynthia Gubitose said the shooting and its aftermath have jolted what she described as a quintessential "Norman Rockwell, New England community." "Nobody knew about Sandy Hook," Gubitose said as she placed flowers at a memorial with bouquets stacked chest-high. "Many of the people that live here like it that way." The symbol of Christmas took on a new meaning in the town, where one memorial featured 26 Christmas trees — one for each victim at the school. Edward Kish said he bought a Christmas tree two days before the shooting but hasn't had the heart to put it up or decorate it. "I'll still put it up, probably," he said. "It doesn't seem right, and it doesn't seem like Christmas." Mourners from across the country came to offer condolences. A jazz band from Alabama played at the main memorial site as local children played with a team of trained therapy dogs brought in to provide comfort. At the Newtown Library, dozens of people gathered for a meeting of Newtown United, a grassroots community group formed in the wake of the shootings. The topic was gun legislation and how the community could push for a ban on assault weapons and other measures to make certain types of guns and ammunition more difficult to obtain. There was a rumor that guests from Washington, D.C., would show up. About 10 minutes into the meeting Sen. Richard Blumenthal and Sen.-elect Chris Murphy walked into the room, to applause and surprised looks. They spoke and took questions for about a half-hour. Around the country, the school massacre continued to reverberate as citizens and lawmakers debated whether Newtown might be a turning point in the often-polarizing national discussion over gun control. President Barack Obama promised he'd send Congress broad proposals for tightening gun laws and curbing violence and pressed Congress to reinstate an assault weapons ban that expired in 2004. He called for stricter background checks for people who seek to buy weapons and limited high-capacity clips. "This time, the words need to lead to action," said Obama, who set a January deadline for the recommendations. Authorities say the horrific events of Friday began when Lanza shot his mother, Nancy, at their home, and then took her car and some of her guns to the nearby school. In a statement released Wednesday, the Connecticut State Police said they anticipate their final report "is several months away."